This FS5 Double UP Package offers great value. We have taken some of our most popular gear and combined it into an exceptional package for shooting quality productions. This is high end gear for getting the best results at your shoot. 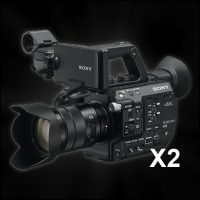 You will get two Sony FS5 cameras in this package. This will allow you to get two angles of any scene or interview on these amazing 35mm sensor chips. We have also included two of our biggest LED panels so you have lighting where you need it. For audio, two radio lapel mics which are included to ensure crisp clear audio can be recorded. The Sony FS5 camera features interchangeable lenses and comes standard with an 18-105mm lens. 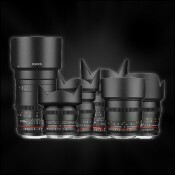 We have a set of Rokinon Prime lenses available as a kit or they can be hired individually. We also have a Metabones lens adapter available for rental which will enable the use of Canon zoom and prime lenses on this camera. This camera has a super 35mm sensor which helps to create that fantastic shallow depth of field and cinematic look. This camera has all the benefits that shooting with a DSLR offers, and has none of the disadvantages. The LED 1000 lights are low power and do not run hot like previous generation lights. LED lights are great as they are dimmable. These lights are great for interviews as they can be used close to the talent without getting anywhere near as hot has traditional lighting. We have an option to add batteries to your order making them even more portable and versatile. These lights are daylight colour temperature balanced. Radio Lapel Microphones are a must have piece of kit for any production. It makes a production so much more professional to have good, clean audio. Being wireless makes it very flexible and easy to use and record your audio. Two are included so two people can be mic’d up for audio capture.